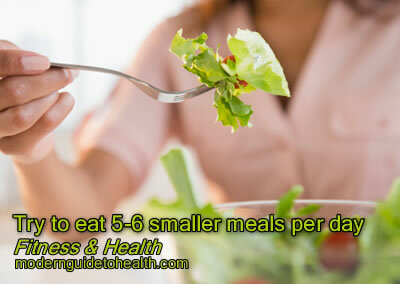 Try to eat 5-6 smaller meals per day instead of the traditional breakfast, lunch and dinner. Try a Breakfast, a Lunch, an afternoon snack, a dinner, and an evening snack. Eating smaller meals keeps your metabolic rate high throughout the day because your body is constantly using up energy to digest the food you are eating. Eating smaller meals will also leave you feeling lighter and more energized throughout the day.